Sometime ago, if a person lost a tooth due to an accident, old age or any other cause, the space in the mouth is either left blank or filled with a denture or false tooth. Apparently, things have changed and dental implants have taken over. 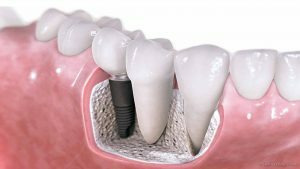 With the help of a professional dentist in Chalfont, you can have your missing tooth permanently replaced via dental implants. Dental implants involve inserting a metal rod in the jawline and molding an artificial tooth or crown where the former tooth was. Since the implant is fused with the existing teeth, the implant will last a lifetime and keep the gumline healthy. You need to have healthy gums and strong bone before a Chalfont dentist can perform a dental implant for you. Dental implants are relatively strong and permanent and can be used to chew foods and do other things regular teeth will do. Your Chalfont dentist will also consider your current medical condition, the condition of your gum tissues and jaws, the size, shape, and position of the jaw bones before initiating any form of a dental implant. You may not be considered for an implant if you have poor dental hygiene, diabetes or smoke heavily due to a higher risk of gum disease and infection. Dental implant failure can occur especially for people with chronic bone diseases like osteoporosis and those who have been taking steroids for a considerable long period of time. Dental implants are made of three major parts: the titanium metal that is screwed into the jawbone, the abutment or post that is fitted on the implant and the crown the provides a natural-looking appearance to the implanted tooth. The two types of dental implants are the Endosteal implants and Subperiosteal implants. The Endosteal implants are the kind of implants that are directly inserted into the jawbone through a surgical procedure. After the spot is completely healed, the Chalfont dentist then performs another surgery where the post is connected to the first implant. The last stage is to fix the artificial tooth to the post. The Subperiosteal implant is slightly different from the Endosteal. In this case, the implants are made of the metal frame that is implanted in the jawbone underneath the gum tissue. As the gum tissue heals, the metal frame will gradually become fixed and the pots that are attached to the metal frame sticking out of the gums for planting the artificial teeth. Dental implants require several months to totally heal, especially if your Chalfont dentist is removing a tooth that will be replaced. The dentist in Chalfont will first pull the teeth on the first day and then place the implant anchor for the new tooth. The entire process will take about 4-8 months to heal. The titanium rod will then bond to your existing jawline through a process called osseointegration. The next stage is where your Chalfont dentist will give you a temporary crown. In some cases, your dentist can place the crown on the same day. If otherwise, you may need to make a second visit to your Chalfont dentist for the molding. Dental implants allow you to regain your facial beauty and smooth eating/talking lifestyle. It allows you to replace your lost tooth with a permanent implant that does all the functions of a natural tooth. The success or failure of a dental implant procedure depends on your health, the drugs used in the process, and the health of your gum tissues. In order to reduce the failure rate, it is always recommended that you visit an experienced dentist in Chalfont. If you are looking for such a dental facility today, contact us at Highpoint Dental Medicine.